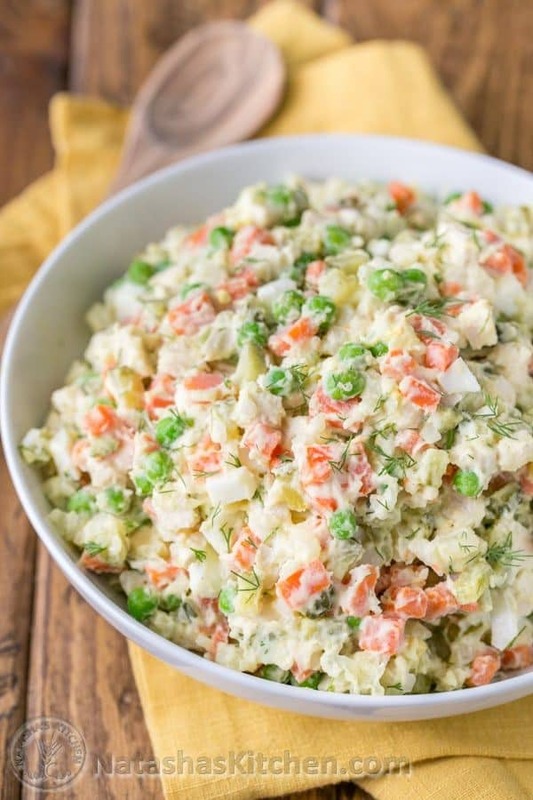 Olivye (sometimes spelled olivier) is a potato salad that is ridiculously popular among Slavic people. 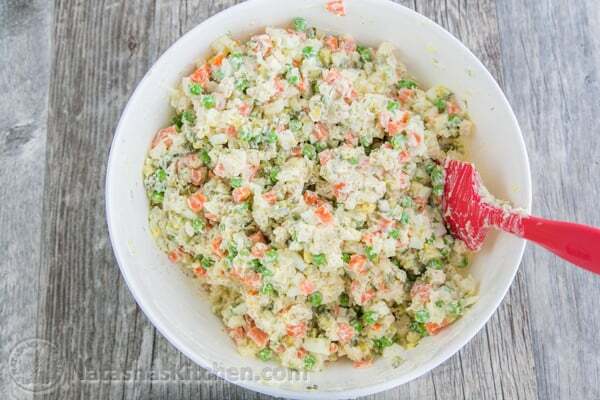 This salad has been and always will be a staple at our church potlucks. 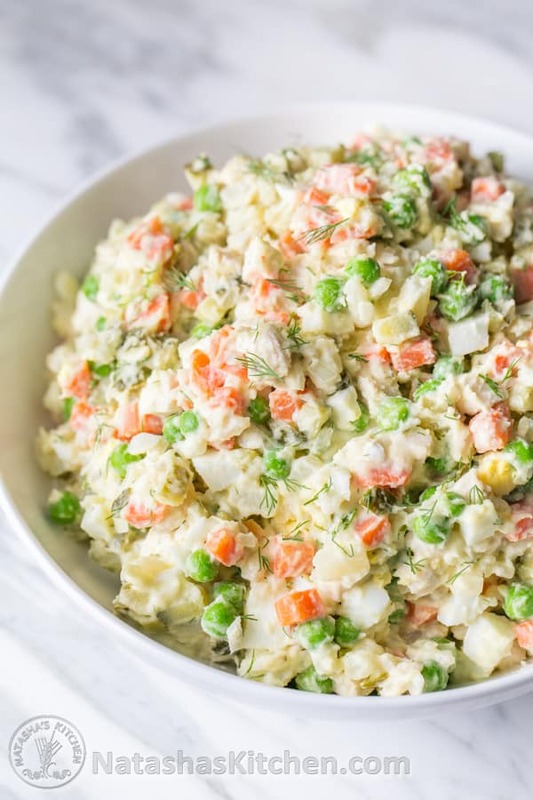 If you’re used to traditional American potato salad, you’re definitely in for a treat with this olivye. I got the idea to use chicken in leu of kielbasa from a birthday party this past weekend. P.S. Don’t miss our quick and easy method of making the carrots and potatoes. With the right tips and shortcuts, you’ll have this salad done in no time! 1. Place chicken breasts in a medium sauce pan (cut large breasts in half), cover with water, add 1 tsp salt and bring to a boil. Reduce heat, cover and simmer 15-20 min or until cooked through. Drain and let rest until cool enough to handle then dice. If using rotisserie chicken, remove skin and dice the chicken meat. Place in large mixing bowl. 2. Peel and finely dice carrots, then peel and dice potatoes the same size as carrots (we use the “chop wizard” with the smaller blade attachment for the potatoes and dice carrots by hand). 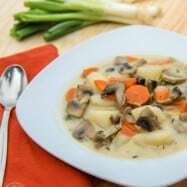 Place carrots and potatoes into a medium pot and cover with water. Add 1 tsp salt and bring to boil. Continue cooking uncovered for 10-12 min or until tender then rinse with cold water and drain. Transfer to paper towels to remove any excess water. Transfer to mixing bowl. 3. 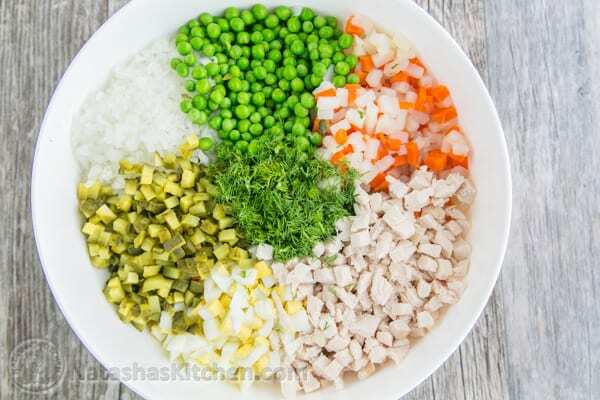 Add remaining ingredients to the mixing bowl: 2 cups peas, 5 diced eggs, 12 diced baby pickles, finely diced onion, 1/4 cup fresh dill. Stir in mayo, salt and pepper to taste. Olivye (sometimes spelled olivier) is a potato salad that is ridiculously popular in Russia and many Eastern European countries. We're changing it up and using chicken instead of kielbasa. Place chicken breasts in a medium sauce pan (cut large breasts in half), cover with water, add 1 tsp salt and bring to a boil. Reduce heat, cover and simmer 15-20 min or until cooked through. Drain and let rest until cool enough to handle then dice. 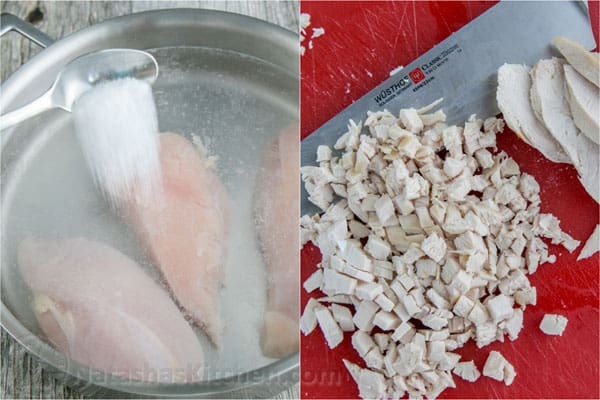 If using rotisserie chicken, remove skin and dice the chicken meat. Place in large mixing bowl. Peel and finely dice carrots, then peel and dice potatoes the same size as carrots. 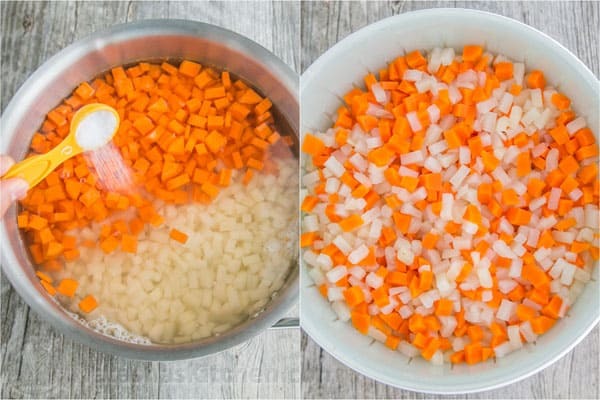 Place carrots and potatoes into a medium pot and cover with water. Add 1 tsp salt and bring to boil. Continue cooking uncovered for 10-12 min or until tender then rinse with cold water and drain. Transfer to paper towels to remove any excess water. Transfer to mixing bowl. 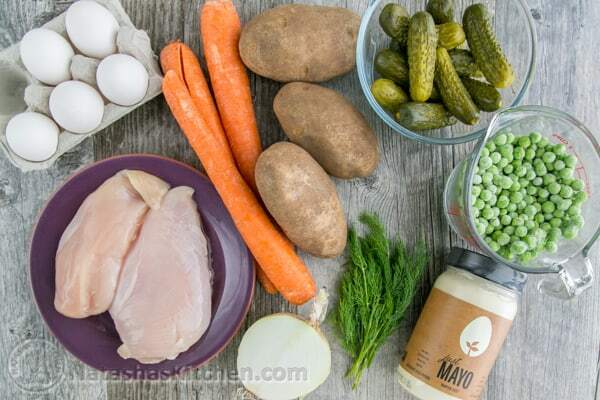 Add remaining ingredients to the mixing bowl: 2 cups peas, 5 diced eggs, 12 diced baby pickles, finely diced onion, 1/4 cup fresh dill. Stir in mayo, salt and pepper to taste. P.S. Here’s a peek at our classic, original olivye. 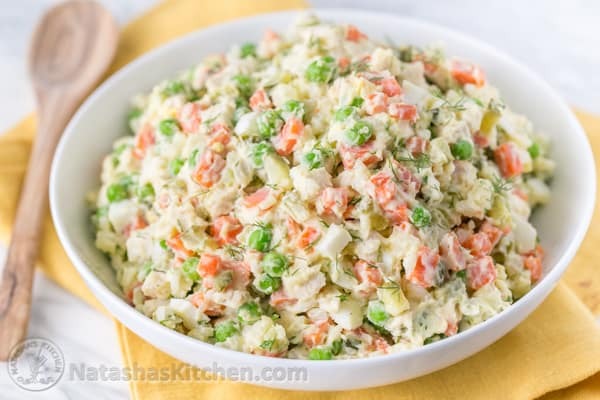 Is there anything unique that you put into your potato salad? Well now, how do I begin? Absolutely brilliant salad! I can only give 5 stars here but this is worthy of 10 stars. I used two large chicken breast at about 650 grams, made a quart of stock as well. I seen the photo of your chopper, I used a french fry cutter on the potatoes and carrots, I leave skin on however. Cut them them into ‘fries’ then a knife to cube them. Cooking the potatoes and carrot together, another brilliant idea that I will remember. They were perfect. 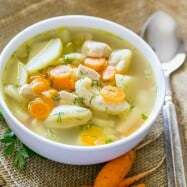 When I boiled the chicken, I added a carrot, 1/2 onion, and a stalk of celery (Trinity) and made quart of broth that is is in the fridge for a Vietnamese soup in a day or two. I did let the chicken cool in the water and it is juicy and tender. I had no peas so I added 4 stalks of celery, diced, perfect addition. This looks amazing! Do you use sweet pickles or baby dill? I plan on making this very soon, sounds and looks very good! After I make it I will come back and rate it. As a variant, I may dice up a daikon and add that. I was going to make a regular basic chicken salad, but realized I had all the ingredients to make olivye so I opted to make that instead. Yay! Although I didn’t have fresh dill 🙁 the Trader Joe’s dried dill seasoning worked just as good! I added a can of the Costco canned chicken rather than all the work of the chicken breast and it that worked out PERFECTLY! I also had diced up radishes as a side, and that tasted great. 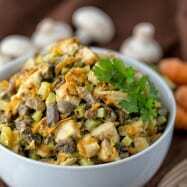 All in all I absolutely love this Russian/Ukrainian/Slavic chicken salad. Thank you! I used mayo, and small cornichons pickles from Trader Joes’s. What do you use? 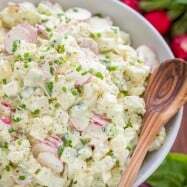 I made the Chicken Olivye (Chicken Potato Salad) over the weekend. I had been looking at this recipe for several days, possible weeks, wondering how my family would like this. I knew I would but, was not sure of the rest of the crew. Well, I am here to tell you, they loved it!! We all thought it was really good. Did not deviate at all from the recipe and it made a huge batch. Interesting combination of ingredients that really go well together. My only correction I would use for next time is maybe add just one more chicken breast. That was a nice touch to this salad. Loved the flavors and how easy it was to make and prepare. I’ve never made the Olivie with chicken before. I usually make it without any meat, and my mom also makes it meatless but adds apples. Adding chicken makes this a meal. My husband and I both took it to work for lunch. I had mine with bread, and he had his with crackers. Very satisfying, and you can’t eat too much because it is so filling. 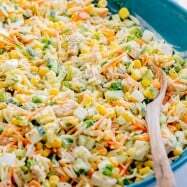 This recipe makes a huge bowl, enough for a party, but we have been eating it for a few days now and it tastes as good as the first day i made it. Love the fresh green peas in it, instead of the traditional canned peas. Adds such a beautiful bright green color, and the peas are less mushy. Love the shortcut of chopping veggies before cooking! I made it even faster by using baby carrots and chopping them in my chopper whole. (My chopper is not Wisard, but just as good). 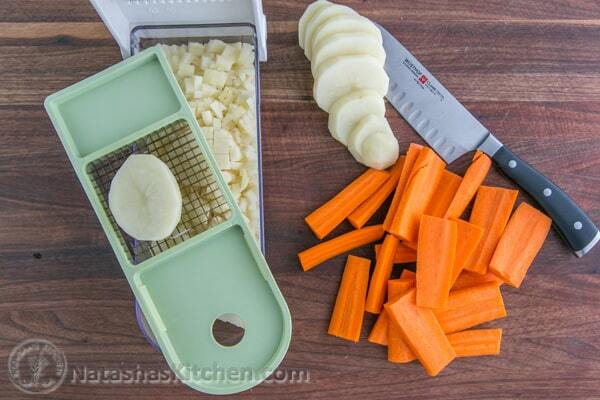 Great time saver not having to peel/ slice carrots by hand ! Also, i added the chopped onions to the potatoes and carrots for the last minute of cooking. It made them soft and took the raw onion taste out (my family does not like raw onions). Wow, great. 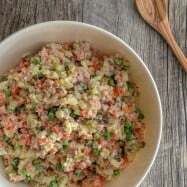 We have our version of this dish in Iran which we call it “salad Olivye”. It’s a popular dish here in Iran with the same recipe except that we don’t add onions and dill. Marina @ Let the Baking Begin! Looks great! Will make for a perfect summer potluck dish.